Here’s an attitude check. Do you have a can do, or won’t do attitude in life? In my workplace, I have some long term contractors, that have become jaded, cynical, and perhaps bitter at life. Whenever a problem arises, they make a mountain out of a molehill, and instead of thinking about what to do to fix it, they explain all the reasons it won’t work, can’t work, and why they will not warranty it. While I understand them not wanting to warranty an engineered solution that was not in their original scope of work, I cannot tolerate them holding up the entire project for something that is commonly done, and costing other companies and clients thousands of dollars. 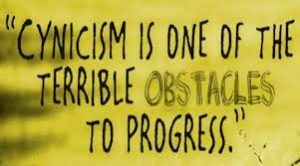 I have a can do, solution based, attitude, that fixes the unfixable, daily. 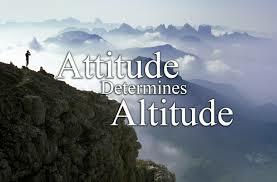 Truly, our attitude determines our altitude.